la petite frill – ooh la la! 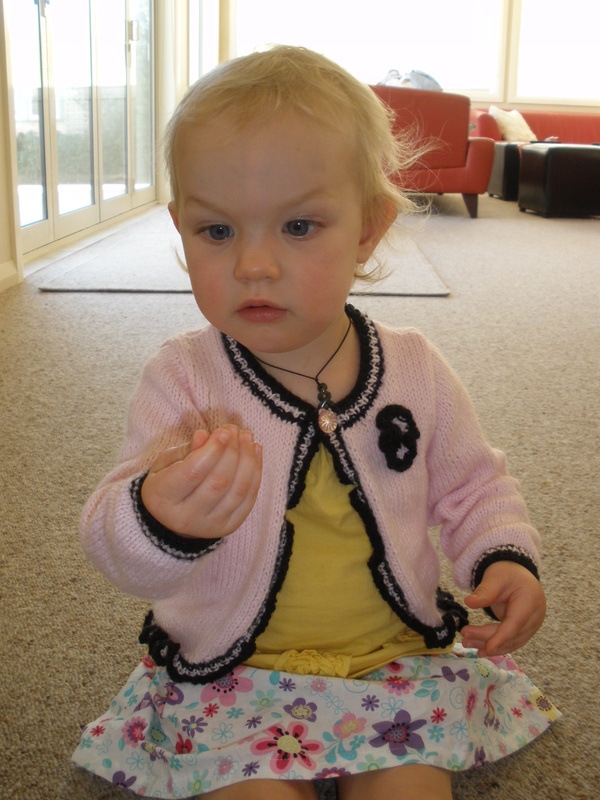 Here is Ania sporting the latest from Bushke (me). I stuck to the pattern down to the colours for this one. 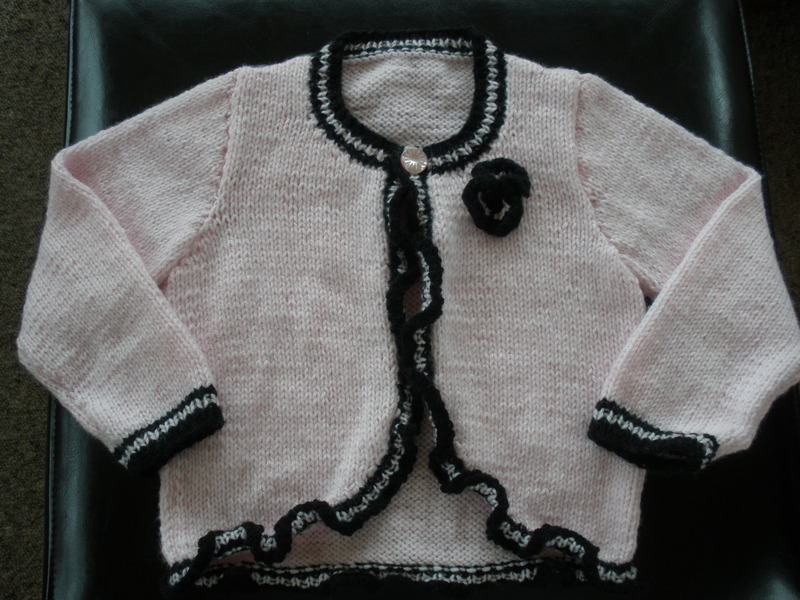 Baby black with the mellow pink is spot on for Ania’s fair looks – Snuggly DK, Sirdar book 347. Over the hols Karen had a ball when she made a visit to Skeinz. All DK and destined for…well, she’s not sure yet. The colours are amazing – if you’re ever near Onekawa, Napier, New Zealand go check them out. You can purchase online as well which is great. 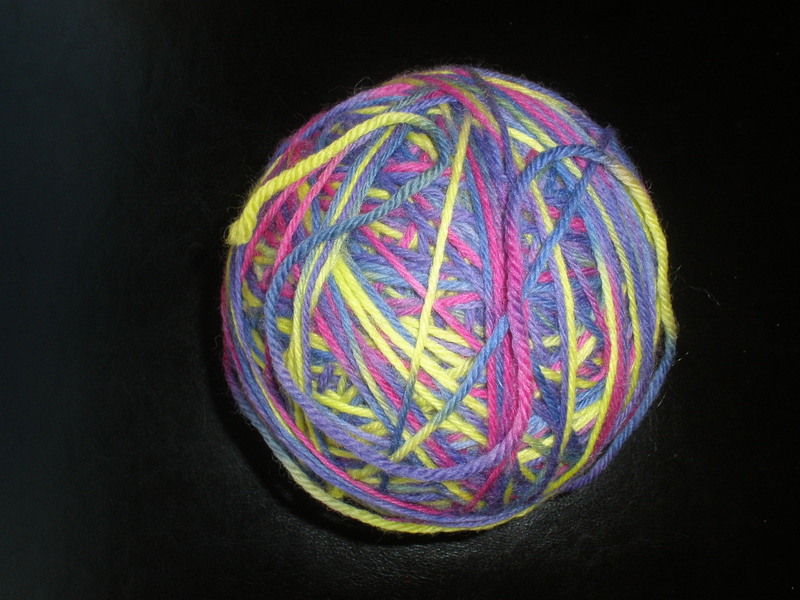 The green multi and pink multi yarns are from their Elan range. 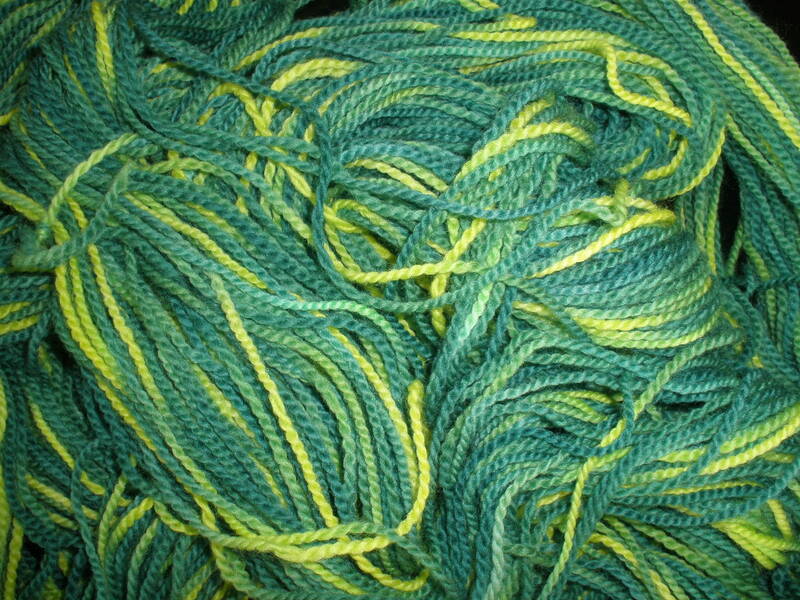 If you’re in to DIY dyeing you could buy from the Skeinz naked range. 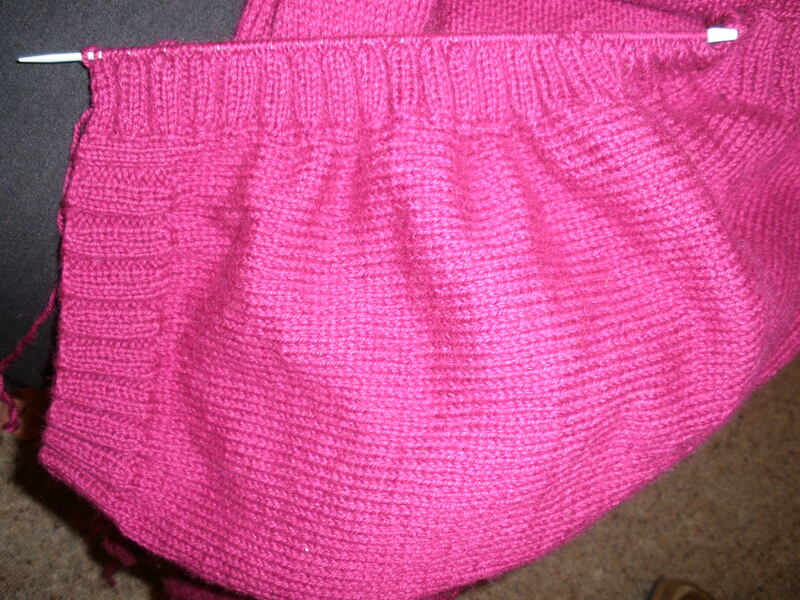 Wendy’s on the home stretch, bands on her sleeveless DK vest in raspberry (Skeinz). Raewyn’s red top is at the washing/blocking stage and this week she worked on a lace weight project. Lindsay’s almost finished her shawl, yay! Casting off can take an age when you’re working with 100’s and 100’s of stitches. 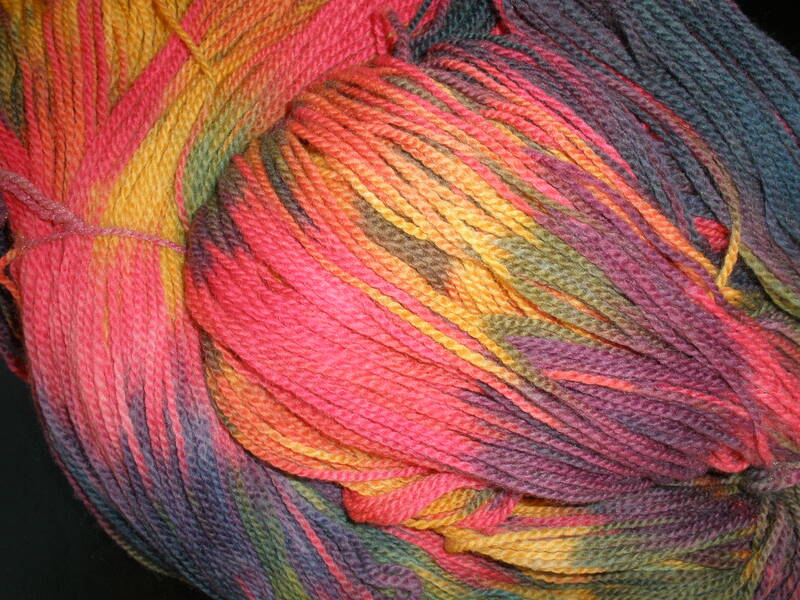 Should have an FO pic in the next week or two. Gail spent most of the the night deciding on a pattern, eventually casting on in Naturally Tussock DK in a beautiful cobalt blue. Enid brought along her WIP in a Cleckheaton multi. 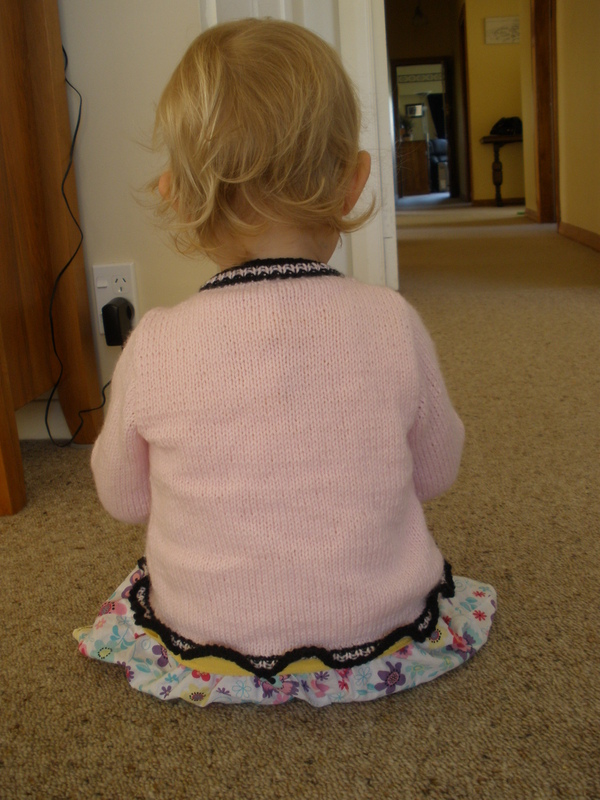 She was going to abandon ship and rework her jacket in a textured stitch, not being keen on the striping effect. The group thought the garment thus far was absolutely gorgeous, I think she’ll keep on with it. Simone worked on her lacey scarf and decided to finish it before picking her socks up again (refer pics last Post). If you enjoy knitting on your own you’ll love knitting in a group with other keen knitters – it’s so much fun sharing the experience…so don’t stay at home and knit alone, come and join the fun, we welcome new members…..and if perchance you read this, live in the locale, can’t knit a stitch but would love to learn – you’re very welcome too!